"...another wonderfully intelligent page turner." Seventeen-year-old Jacqi Garza has one last chance to reclaim her life, if she can just learn to trust the most unreliable creature of all—someone who honestly cares about her. When she was eight years old, Jacquelina Garza was the second of two nearly identical girls abducted by a child predator in the northern California town of Rio Mirada. Three days after her disappearance, Jacqi managed to escape—physically, at least. Ten years later, she's climbing out of the crater her life has become. In the aftermath of her abductor's trial, her life spiraled out of control, until, at age sixteen, she was working the streets, hustling everyone in her life—and protecting a very dangerous secret. A counselor named Lonnie Bachmann tries to help, but she insists on honesty—and Jacqi knows the truth is unforgiving. She vanishes again, this time with the intention of scrabbling up $2,000 so she can leave town forever and make a new life in Mexico. Lonnie, aware she pushed Jacqi too hard, enlists the aid of Phelan Tierney—a former litigator with ghosts of his own, who now works as a kind of "twenty-first-century handyman," helping people who hope to start their lives over. He was tutoring Jacqi for the GED when she disappeared, and Lonnie asks him to find her, urge her to come back. Tierney soon realizes that, as over-exposed as Jacqi's life has been, something crucial remains untold. And he feels a special commitment to helping her brave that truth. But Jacqi's been manipulated, betrayed, and preyed upon by an army of people who "only had her best interests at heart," including her criminally-connected family. Worse, just as Tierney makes contact with Jacqi, she's once again drawn into a case that threatens to tear Rio Mirada apart: The murder of Mike Verrazzo, former head of the firefighter's union and the man everyone blames for driving Rio Mirada into financial chaos. Jacqi was there when he was killed, but no one, not even the police—for reasons that go back a decade—want her anywhere near a witness stand. The Mercy of the Night offers a story of one girl's personal redemption amid a clash of convenient lies and difficult truths, set in an American Everytown midway between the tony wealth of Napa and the shimmering towers of San Francisco. "Corbett handles his story line and subplots adroitly, in economical but polished prose, but his real strength is in character development; Tierney and company are so real they seem to step off the pages. Superlative hard-boiled crime fiction with a strong emotional center." "[A] gripping crime novel ... [and a] thrilling roller-coaster ride [that] builds to an exciting conclusion." "[A]n ending reminiscent of a Quentin Tarantino film." "Corbett doesn't stint on either narrative or psychological complexity, and readers who stick with Jacqi and Tierney and Skellenger will feel that they've been expertly put through a wringer." "Yow... David Corbett's latest is deep and wide, and with gigantic heart. It's been a long while since something had me choked up in its final pages. This writer's bar just got a lot higher." "Corbett is a brilliant writer and he's penned another wonderfully intelligent page turner. VERY HIGHLY RECOMMENDED!" "Thanks for writing this book. I'm actually forcing myself to stop every night to keep some of it for later. I can't go on here long enough about the incredible human portraits and the dialogue and inner-monologues that are so vivid and suited to each character (and the poignant personal experience incorporated)." "Corbett has a real way with words, giving each character a clear tone and painting a gorgeously clear picture of places and circumstances without getting all three-syllable-y about it. His books have won numerous accolades, and The Mercy of the Night will no doubt earn him more." "I read David Corbett novels twice, once for the gritty, deft plotting then for the beauty of his prose. Creating painstakingly real characters and engrossing dialogue, Corbett is the best of Quentin Tarantino and Elmore Leonard. 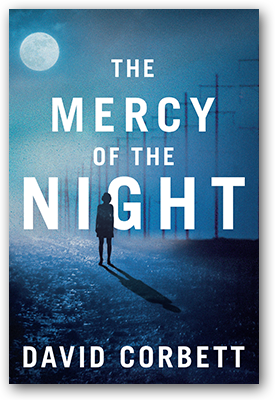 Nobody writes crime fiction better, and The Mercy of the Night may be his best yet. In a word, Brilliant!"